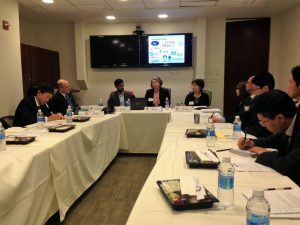 On May 22, 2017 Sasakawa USA held a special roundtable discussion featuring Sharon Burke, Senior Advisor of the International Security Program and Resource Security Program at New America, and Tarak Shah, former Chief of Staff and Senior Advisor to the Under Secretary for Science and Energy in the Department of Energy. The two speakers traveled to Japan in March as members of the 2017 Sasakawa USA’s Emerging Experts Delegation (SEED) trip held in partnership with New America Foundation, where delegates met with Japanese experts and counterparts to exchange opinions on Japan’s energy and climate change challenges and to learn about the importance of the U.S.-Japan relationship. The roundtable discussion was an opportunity for the 2017 SEED participants to share their key findings and takeaways from the trip and to network with D.C.-based representatives from organizations and ministries they visited in Japan. The focus of the roundtable discussion was “U.S.-Japan Cooperation on Energy and Environment: Findings, Recommendations, and Next Steps,” and the delegates shared their observations and analysis of Japan’s energy and environmental policies, and reflected on possible improvements to the systems already in place. The invited guests also had the opportunity to share additional viewpoints for the delegates to consider, and the group had a spirited discussion on defining Japan’s energy strategic drivers. The discussion ended with a networking lunch for the delegates and guests. The event was invitation-only and the discussion was held off-the-record. Click here for more information on the Sasakawa USA Emerging Experts Delegation (SEED) Program.